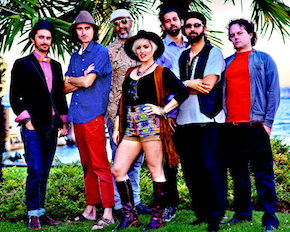 Live at Guilt & Co.
Coco Jafro is a melting pot of inspiration that reflects the collective of musicians from different continents, cultures and religions. From North African traditional music to Afro-Latin funk fused with throwback 60's rhythms. Their recent full-length album Forces of Nature (2018) is the reflection of the band's high energy performances while still following their mantra of remaining grounded, protecting our earth and being in harmony with it. With a live show that encourages the freedom to dance, the freedom to think and the freedom to exchange culture and energy without oppression, suppression or repression, it is no surprise that Coco Jafro have become icons in their community. 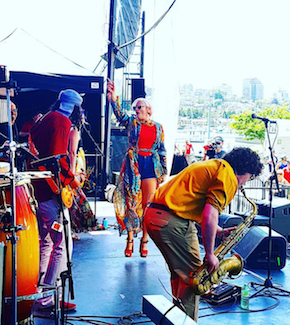 The collective has been playing sold out crowds at revered hot spots like Frankie's Jazz and Guilt & Co, and have been recognized for their impact earning a nomination as the ‘Best Live Act' from the Van Isle Music Awards. As their sound spread further they were honoured with nominations from Breakout West as the Best Urban Artist of the Year and regional finalists in CBC's esteemed Searchlight competition. Their new record is poised to shake the firmament with world spanning beats and soulful savvy lyrics to engage, enrich and embolden those among us hungry for an inclusive human evolution. Seize the future and start the party with the always relevant, always exciting, always progressive COCO JAFRO! for Film, TV, Commercials, etc!